Facebook marketing is really important for small businesses now. Here are ways you can learn how to get started and how to use it to grow your business. These include Chicago Facebook classes as well as online videos, how-to blog posts and links to Facebook pros for more. In this free, recorded, SCORE webinar, we’ll dig into some of the top Facebook features including proper setup, design, layout, Facebook Instant Messenger and even Facebook boosted posts. Mari Smith, long time Facebook pro with blog categories that include Facebook ads, fan pages, marketing, support, tips and video. Jon Loomer, expert on Facebook Ads, with great blog posts and high quality Facebook Ad training. Check out his free Facebook Advertising Webinar. 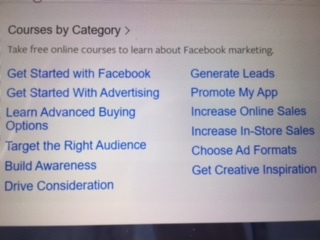 Rick Mulready, expert on Facebook Ads, with an excellent Art of Paid Traffic podcast and courses on Facebook Ads for Local Businesses and FB Advantage Course. Find selected how-to blog posts on these key Facebook topics, curated on an ongoing basis by SCORE Chicago mentor Peg Corwin. Find great resources that teach Facebook users how to run ads on Facebook, including online videos, online courses and blog posts. Use Facebook marketing to excel your business! Take this top rated course to optimize your Facebook ads today! 7 hour class for $10. Paid courses listed on CourseHorse, some a day long, some an extended course. SCORE Chicago offers both free and paid workshops on social media.